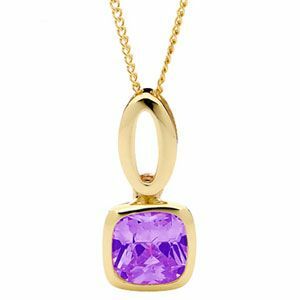 Contemporary Amethyst pendant featuring a stunning cushion cut and buffed gemstone and crafted from solid 9 carat gold. Comes with a free gold plated chain. Gemstone: 1 x amethyst purple cushion cut 7x7 mm. Material: 1 x grams solid 9ct yellow gold. Material: 9ct yellow gold plated chain.